This is an authentic Foo Fighters signed strat-style pick guard with a complete airbrushed guitar. 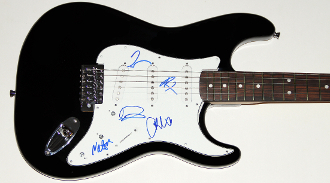 Dave Grohl, Taylor Hawkins, Pat Smear, Chris Shiflett, and Nate Mendel signed this particular pick guard in New York City in July 2015. The signatures are solid and were signed by each of the band members using a blue permanent felt tip. This guitar signed by each of the members is guaranteed authentic and comeswith my (LOA) Letter of Authenticity that carries a lifetime guarantee for this item and states the date and place the guitar was signed. If you have any questions feel free to email me. Thanks for visiting and be sure to check out my other authentic treasures for bid.